Ta-da! 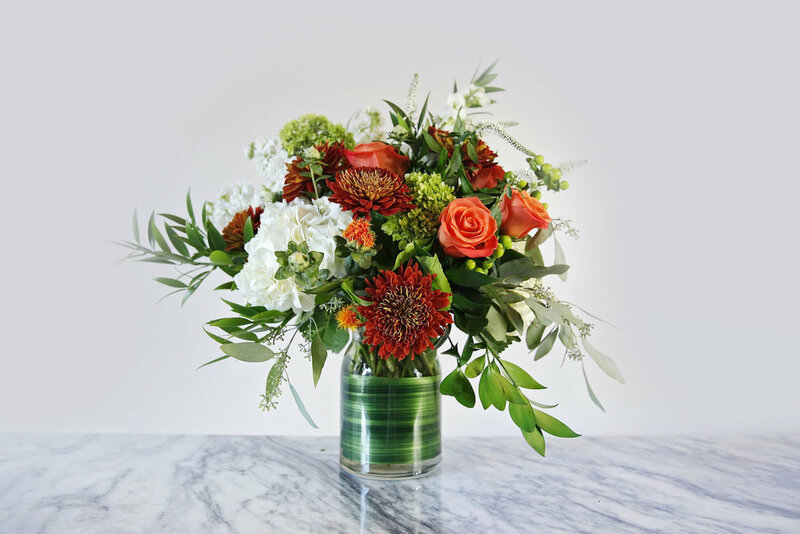 Fall colors and flowers are back in our Leesburg, Virginia studio. It’s so fun to design each new collection, and, as usual, the new flowers arrive just when we are all clamoring for a little change. I always say, floral design really mimics clothing and home fashion for each season. Change gets us really excited about our work, especially these types of joyful changes. My team and I prepared a short video about the collection (see below). Here’s a little more information about our Fall Collection and how we styled our current designs. We chose three different color palettes: orange and white, yellow and red, and a slate of jewel tones. Each palette has a name that suits the color family. Tthe jewel-toned, Heritage Collection, includes sapphire, royal purple, amber, gold and ruby. We’ve selected local garden favorites like Snapdragon, Veronica, Disbud Mums, Yarrow, Roses and Hypericum Berries for this series. I purposefully included soft shades of greens like Eucalyptus and the stronger green that we see in Nagi. The “San Juan” is $65. We’ll donate $7.50 to a local San Juan, Peutro Rico food bank. The smallest of the designs in this series is called the San Juan and with each purchase of this design we donate $7.50 to a local relief organization in San Juan, Peurto Rico. We are always so inspired by the tropical flowers that we use throughout the year and find it so hard to watch this region of our great nation struggle in recovery. Within the next few days, we will select another design that will include a contribution from J. Morris Flowers to the American Red Cross in support of our nearer neighbors affected by Hurricaine Florence. The Maple Collection includes shades of orange, plus white and green. Each design is named for some of the Maple families most amazing varieties. These are the trees that will bring true brilliance to the Eastern Seaboard this fall. These are simpler designs that include fewer varieties making the overall effect a little more modern. The designs are lush and full and include Roses, Hydrangeas, Hypericum and the softer Lisianthus. We’ve lined the clear glass vase with an Aspidistra leaf and used two sizes of white cylinders for the other two designs. Want to get someone’s attention? Send a design from the Maple Collection. 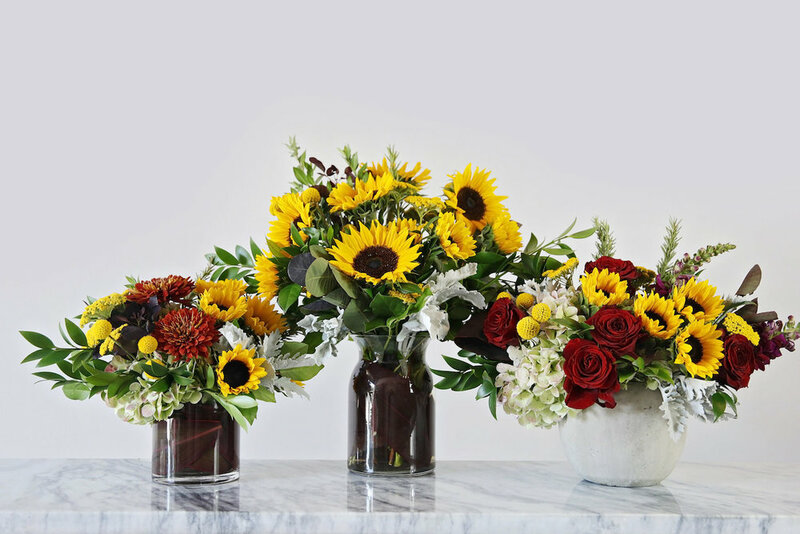 The final series in our Fall Collection includes Sunflowers as they reach their full height all over Northern Virginia. The round, yellow, “ball” shaped flowers are called Billy Ball. 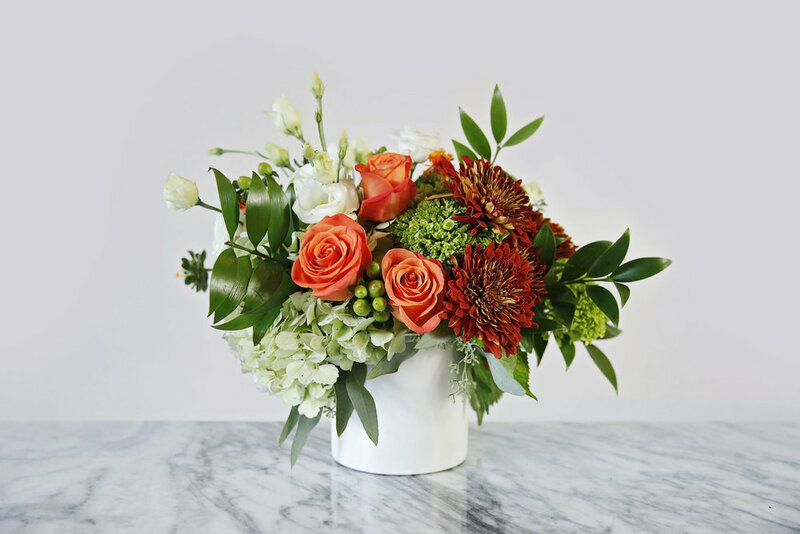 We added Yarrow in a similar golden color and the Copper mums are flecked with this same gold tone Purple Snapdragons and red Roses create some deep contrast, softened by the beautiful Antique Hydrangea. We’ve added a greenery called Smokebush that is burghundy. The glass vases are lined with a burgundy Ti leaf. You are welcome to call us and create your own design as well. Meredith is our Customer Service Team Leader and very knowledgeable about the flowers we have in the studio. Call 703-779-3530.